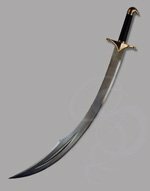 This scimitar is probably closest in nature to a Turkish Kilij, with its maniac tip flare and narrow forte (start of the blade, near the hilt, for those of you who were smoking in the courtyard during your Sword Anatomy 101 class). The sword is not 100% historically accurate, but it embodies the spirit of the Kilij wonderfully. The blade starts narrow (at the aforementioned forte) then swoops into a massive flaring tip that seems to defy physics. With its weight-forward design, these blades were wonderful for chopping melons (and I ain't talking about the fruit). 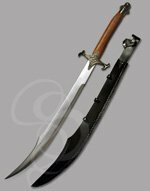 This particular Kilij reproduction has a Stainless Steel blade, making it much lighter than it would have been had it been high-carbon (although, if you're looking for a fully tempered, high-carbon Scimitar similar to this one, check out our Firedancer Scimitar). 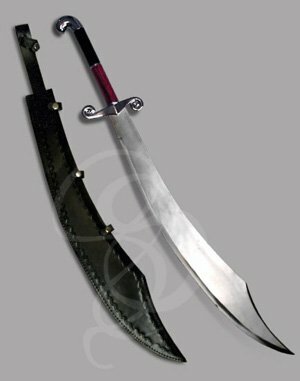 This makes it an ideal sword for carrying around and swinging. It also gives the sword an amazing balance, despite the monolithic killing end. The hilt on this scimitar is made from two types of polished rich-grain wood. Each piece is a different color, which gives the grip a very refined look, and balances the savage appearance of the sword nicely. A chrome spacer separates the two pars of the grip, adding to the rich appearance. Chrome crossguards and pommel complete the sword. 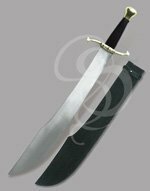 The scimitar comes with a leather side-entry sheath, designed specifically for this sword.